Freeware linear-phase 16-band graphic equalizer plugin with multi-channel operation support (supporting up to 8 input/output channels, audio host application-dependent). Marvel GEQ offers extensive internal channel routing capabilities, and supports mid/side channel processing. 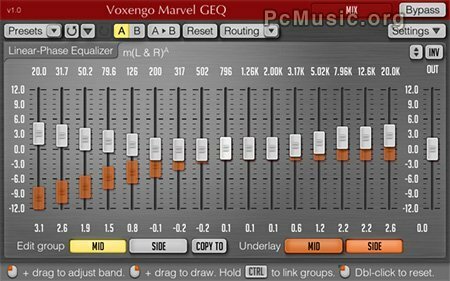 Marvel GEQ is available in AudioUnit and VST plugin formats, for Mac OS X (v.10.4.11 and later) and Windows (32-bit and 64-bit) computers.